7q11.23 dosage imbalance is responsible for symmetrical neuro-cognitive profiles in Williams-Beuren Syndrome (WBS) and 7q11.23 microduplication syndrome (7dupASD). Isogenic cell lines are the best control to discern between the healthy and diseased condition. For this reason, using the CRISP-Cas9 technology we created a wild type isogenic cell line for studying the 7q11.23 microduplication syndrome and we are going to do the same, with another strategy, for the Williams-Beuren syndrome. 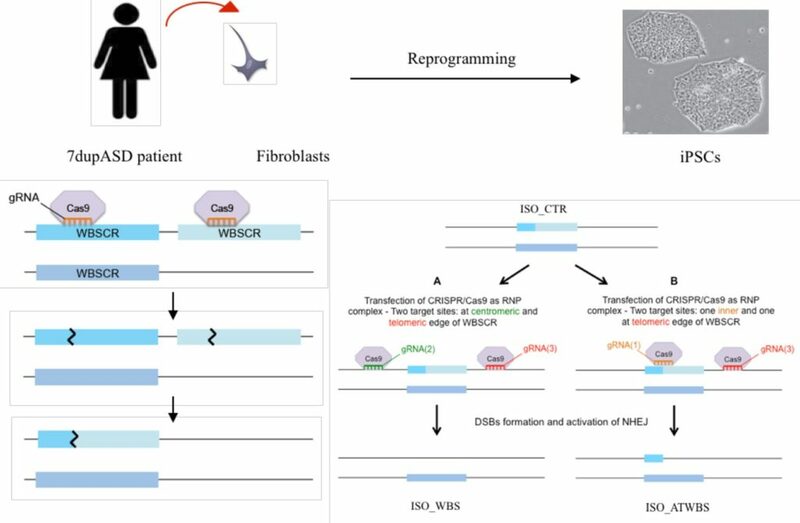 Next steps will be the iPSCs differentiation in cell lineages relevant to WBS and 7dupASD syndromes (bidimensional coltures of cortical glutamatergic neurons, neural crest stem cells, cortical sferoids) and the RNAseq analysis of 242K, isogenic iPSCs and differenziated cells for a detailed characterizzation of the WBSCR region contribution to WBS and 7dupASD syndromes pathogenesis.